The rental business would be significantly simpler if there were one universal lease agreement form that could be used in every situation. Unfortunately, that is not the case. Because lease agreements must address the specific rental property and the particular landlord’s policies, deciding what should be in yours can be confusing. It is common to include an introductory provision — aptly dubbed the “purpose clause” — that limits the tenants’ activities to residential use only. This is an important provision in situations where a tenant’s in-home business might increase the landlord’s costs or liabilities, or disrupt other tenants. In order for the rules in the lease to be enforceable against a tenant, that tenant must be named in the lease agreement. While that seems simple enough, some landlords make mistakes at this point. For example, the landlord may not list the tenant’s legal name, or might leave some occupants out. Avoid these mistakes by using the name on the tenant’s photo ID, and listing every adult occupant. Also, the tenants’ names typically are listed in two places: in the first paragraph or so of the lease, and then again at the end, in the signature block. The signatures are crucial — so be sure that the names match what you’ve listed in the lease. Sometimes landlords get into trouble by not listing all fees, charges, deposits and rent in the lease agreement. These items must be included in the lease. For clarity’s sake, they should be listed separately. When using standard lease agreement forms, it is easy to make the mistake of leaving a line blank. That can create confusion for the tenant during the term of the lease, and also when it comes times to enforcing the lease. It’s worth noting that allowable charges vary from state to state. While items like first and last month’s rent, security deposit, and an application fee to cover tenant screening are well-accepted, other charges may be prohibited or severely restricted by local rental laws. Always check to see what is allowed before putting that charge in a lease. Also, if you manage multiple properties, be careful when using the same lease agreement for properties located in different cities or states. Rights and responsibilities are the heart of the lease agreement, and this provision must be tailored to the specific property. Items like utilities, lawn maintenance and smoking restrictions must be spelled out clearly in the lease. Keep in mind these provisions serve two purposes: first, the tenants must know the rules so they can abide by them, and secondly, if it comes down to legal action, a landlord must prove a tenant violated the lease. A common mistake with this portion of the lease is demanding tenants give up rights provided by local rental laws. Examples include demanding that the tenant forfeit the right to notice before the landlord can enter the property, and shifting the cost of repairs and maintenance to the tenant. In today’s rental market, it is smart to include provisions regarding guests. Tenants must remain responsible for the behavior of their guests, and landlords must retain the right to run a tenant background check on long-term occupants. Renewal is an important consideration for the lease agreement. Otherwise, after the original term, special rules can come into play that control issues like rent increases. While some lease forms include a provision for automatic renewal, this clause should be reviewed with care. That provision may extend a good tenancy, or prolong a bad one. Many landlords prefer that leases be renewable for another full term rather than month-to-month. This allows for more control over the next vacancy date, as well as providing an out when a tenant has been misbehaving. 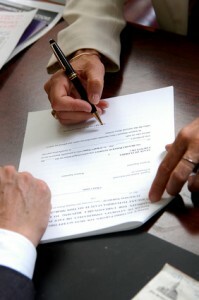 The lease must contain some consequences in order for tenants follow the rules. The remedies must relate to the house rules and must be realistic. These threats must be followed in every case; it’s not okay to evict one tenant while forgiving another. A good rule to follow is to only include actions that the landlord is prepared to take. Otherwise, tenants will call the bluff. While eviction is a common remedy, it also is an expensive way to resolve disputes. That’s why many landlords adopt a multi-tiered approach that includes a warning. Disclosures or policies such as a crime-free addendum or no-smoking rules can be listed on separate pages. Just be sure that those pages are referenced in the body of the lease. It is extremely helpful if these items are referenced by title. You would be surprised how often landlords forget to attach a copy of the referenced exhibit to the lease agreement. If tenants are left in the dark, they can’t comply with the requirements. Likewise, provisions omitted from the lease agreement are virtually impossible to enforce. Roommate rentals are increasingly popular in today’s rental market. These tenancies pose a special set of challenges, and the lease agreement must be modified to meet those challenges. There always should be only one lease agreement per rental unit, no matter how many proposed occupants. At the same time, a single-renter lease agreement needs to be modified, in particular, to include a provision addressing joint and several liability. That way, tenants will understand that if one moves out, that may terminate the lease agreement, and that any one tenant may end up paying for all the rent or all of the damage to the property. And, don’t forget to add extra signature lines to accommodate multiple tenants. Previous post: Can Tenant Withhold Rent to Pay for Upgrades?